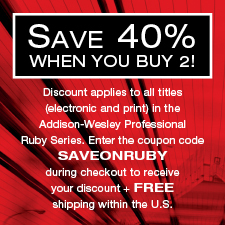 The Addison-Wesley Professional Ruby Series provides readers with practical, people-oriented, and in-depth information about applying the Ruby platform to create dynamic technology solutions. The series is based on the premise that the need for expert reference books, written by experienced practitioners, will never be satisfied solely by blogs and the Internet. Series Editor Obie Fernandez is the CEO and founder of Hashrocket, Inc., a boutique web consultancy and product shop based in Jacksonville Beach, FL, and has more than 12 years of experience as a software developer. As a senior consultant at ThoughtWorks, Fernandez specialized in complex custom enterprise software projects. A pioneer in Ruby on Rails development, he writes a popular blog, is a regular contributor to the Ruby on Rails podcast, and is the Ruby community editor at InfoQ.com, one of the webs premier technology portals.